The doors open at 5:30 p.m. and the music starts at 6:00 p.m. and the fun blasts away until at least 11:00 p.m. Ten different acts will take the stage Saturday for one of the year's best nights of local music. The styles range from blues to folk to rockabilly to Irish. Throw in some singer/songwriters and a few surprise celebrity emcees and you have the makings of a great evening. You can see the full line-up with start times under the tab above or by clicking here. Jake's Music Festival is now in it's tenth year of great music for a great cause. The cause is finding a cure for Type 1 diabetes. Because of our generous sponsors (see their names to the right) every dollar donated tomorrow night will be given to the local chapter of the Juvenile Diabetes Research Foundation. In addition, there is a silent auction with some fantastic items. So bring your checkbook. There will also be Michigan beer in the concession stand, free cupcake samples, commemorative t-shirts and more surprises. It will be the best night of the spring, so make sure you're at Wealthy Theatre early to get a seat for a night of spectacular music and fun. We are going to be all over the local airwaves in the next week talking about the festival, having live band performances, and just genrally getting folks fired up for next Saturday's show. Here's a list of where we're scheduled to appear. Remember that this is broadcast media so those times could shift a little. We'll also post links once the stations put them up. The 10th anniversary Jake's Music Festival takes place 4 weeks from today. This year promises to be one of our best shows ever. We have a great mix of new performers and old favorites. Plus a silent auction, free cakes samples from Connie's Cakes, and craft beer for sale in the concession stand. Plus gift certificates from the Civic Theatre, GR Public Museum, and GRAM. Remember this is a free show. Come enjoy yourself and please consider making a donation to the Juvenile Diabetes Research Foundation. 2014 is shaping up to be a great year. We are still booking bands but we wanted to give you a peek at who's going be there. Plus we will have a silent auction, free 10th anniversary cake samples, and Michigan beer in the concession stand. More bands and more fun will be announced as we get closer to the show date. 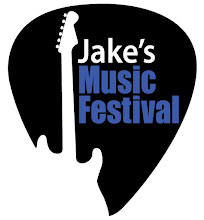 We are pleased to announce that the 10th anniversary Jake's Music Festival will be held on April 12, 2014 at Wealthy Theatre in Grand Rapids, Michigan. Mark your calendars now. We'll be announcing the bands in the near future.